We love it when you’re browsing a bookshop and discover some Beatle titles you weren’t previously aware of – and that they are at hugely discounted prices…. That’s what happened this week when we found two new Beatle books. 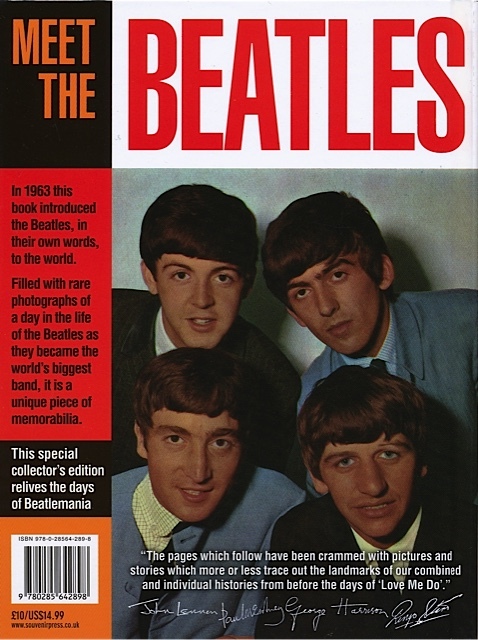 We also took delivery (via The Book Depository online store) of a brand new Beatle book – but more on that one later. 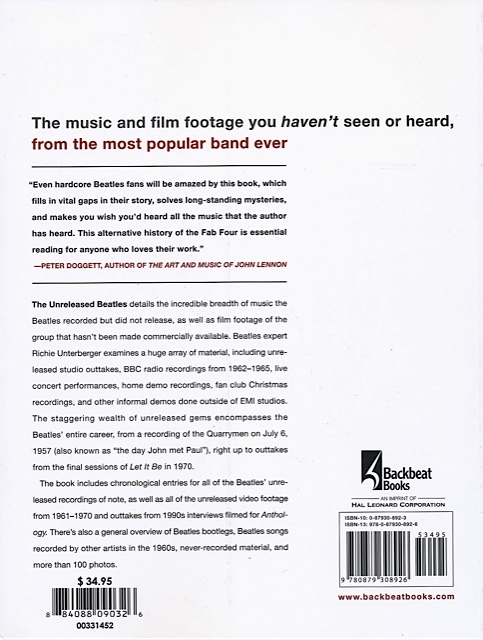 The Unreleased Beatles includes a general overview of Beatle bootlegs, their songs recorded by other artists in the 1960s, never-recorded material, and contains more than 100 photos. 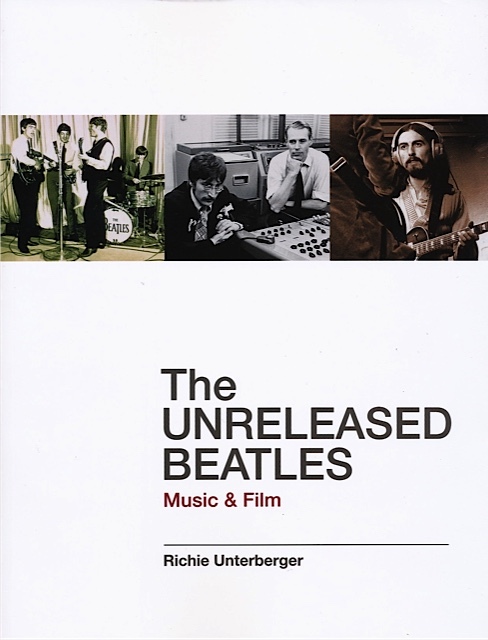 Beatles Examiner conducted a Q&A session with Richie Unterberger about the book when it was first released, and Amazon has a “Look Inside” feature if you’d like to see more. Also – Glass Onion reports that an updated and fully revised Kindle version of this book has just been released. Worth checking out if you like electronic books. Compiled by journalist Joan Athey, and based around a fantastic series of photographs taken by Gerry Deiter during the course of the bed-in, Give Peace a Chance presents as a wonderful chronicle of just what happened in their suite on the 17th floor of the Queen Elizabeth Hotel in Montreal. 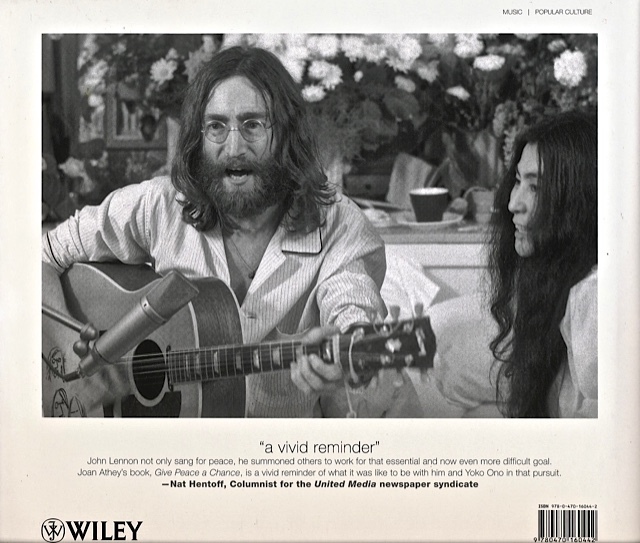 Photographer Deiter was on assignment for Life magazine and had extraordinary access because Lennon and Ono asked him to stay by their bedside for the duration of the event. As it turned out his photographs were never actually published in Life. He tucked away the negatives soon after John and Yoko vacated the famous Room 1742 – the place where the song ‘Give Peace a Chance’ was recorded – and so they are being seen in all their glory, many for the first time here. There really are some amazing photos and recollections from all sorts of people in this book. It is well worth the A$4.99 we paid for it! 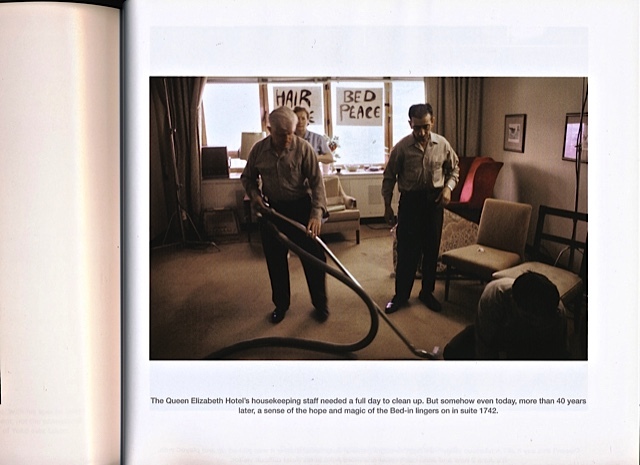 One page amongst many which caught our attention was the one below – taken at the very end of the eight days with hotel employees cleaning up the suite after the John and Yoko entourage had moved on: I really like this book. It captures an historic moment in time in a remarkable way. 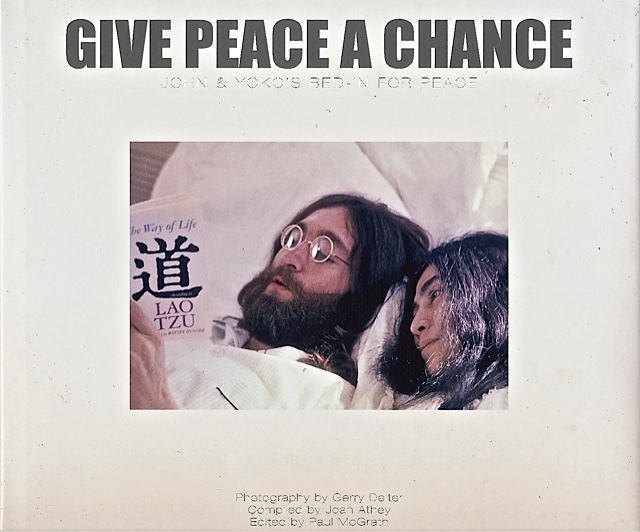 For a couple of further unique insights into the Montreal John and Yoko peace bed-ins see also I Met the Walrus by Jerry Levitan, and Give Me A Chance by Gail Renard. The final book added to the collection this week is a 2014 publication called Meet the Beatles from Souvenir Press in the UK. The Wogblog first alerted us to this one. 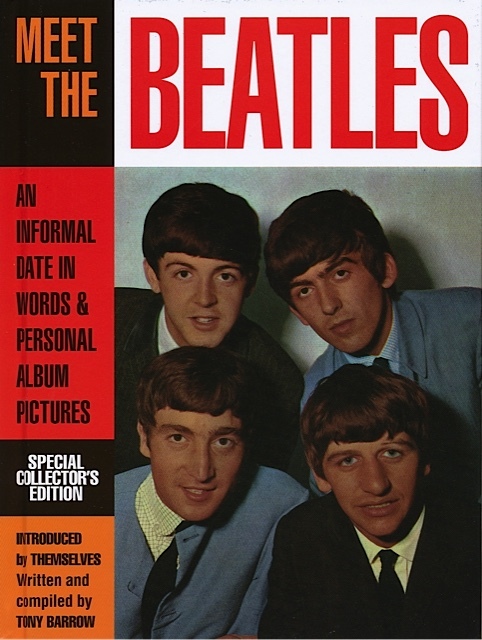 In this the 50th anniversary year of the the Beatles, Meet the Beatles is a hardback publication which faithfully reproduces a magazine originally issued in the hey-day of the Beatles first flush of success in 1963. No need for us to go into too much detail here as Wogblog has covered it pretty well in his post. 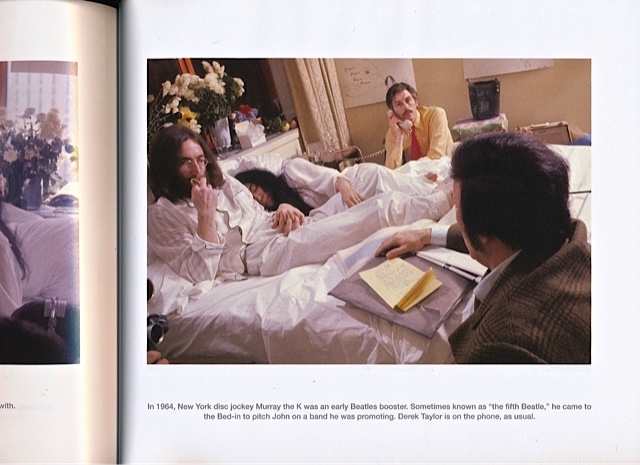 This entry was posted in Beatles, Beatles Books, Beatles Collecting, Beatles Music and tagged Beatles, Beatles Books, Beatles Collecting, Bed-In for Peace, Give Peace A Chance, John Lennon, Unreleased Beatles, Yoko Ono by beatlesblogger. Bookmark the permalink. I just came across a copy of The Unreleased Beatles today. Nice addition to my Beatles library.